It’s all our fault. America and India, that is. When the British Empire was at it’s height of power it was sending troops to three continents. It would have been an extreme hardship for the officers, gentlemen in a class above that of the common soldier, to have traveled to these far-off places without the comforts and trappings that they were used to at home. That meant that the campaign tents that were pitched in the American wilderness and the jungles of India had to be filled with proper furniture. Soon the best furniture makers in London, including Thomas Chippendale were turning out pieces which were designed specifically for, well, camping. To maintain the prestige of the British Army the furniture they brought with them had to be practical, portable and stylish. These were more than just a few choice pieces which were tossed into a cart. Some officers, when ordering their camp furnishings at the British Crown’s expense, selected nearly 50 pieces including beds, chests, writing tables, bookcases and chamber pot holders. The size of some of the tents they inhabited while on campaign would have rivaled the size of the average room in a fine country estate. Not to mention the caravan of wagons and horses necessary to carry it all from place to place. I first learned about campaign furniture while I was working on The Patriot in 1999. 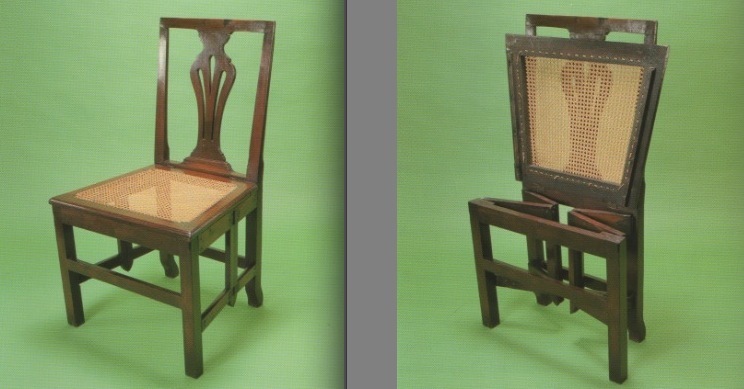 We reproduced some Georgian campaign chairs like the one below and I was struck by the ingenuity of the design. Some of the comfort may have been compromised but not the style. Sure the stretchers were flat and mostly featureless but the overall lines were there. 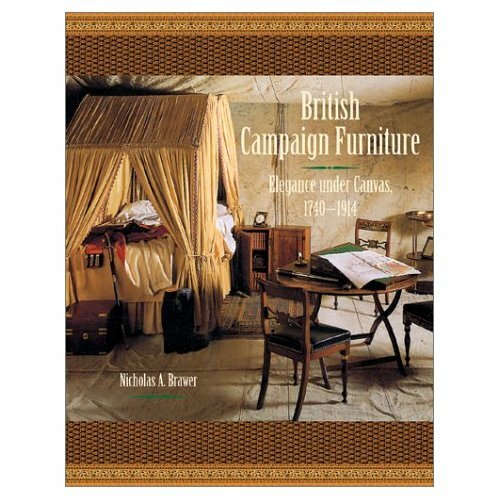 Three years later I came across Nicholas Brawer’s book, British Campaign Furniture 1740 – 1914. It still remains, amazingly, the only book on the subject. 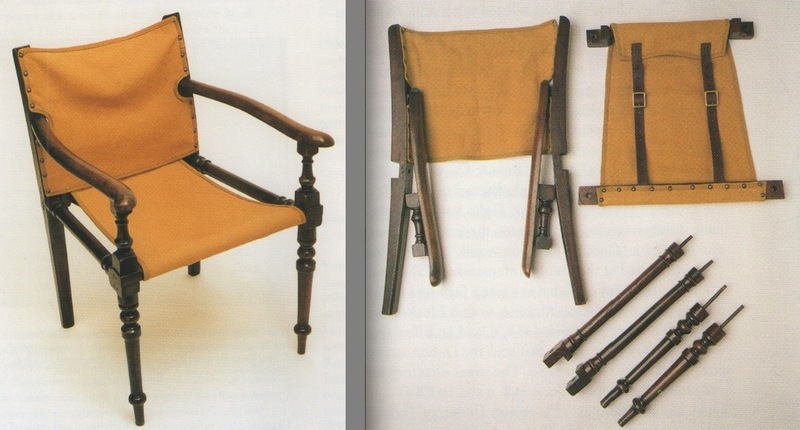 Brawer explains that the real explosion in campaign furniture came after the Napoleonic Wars, when a brisk increase in travel both on the continent and abroad created a huge market for portable and functional furniture. In 1899, the British Army experienced an entirely new type of war. The Boer War in South Africa changed the way people thought about modern conflict and the idea of a ‘Gentleman’s War’ was gone. The over-designed and over-stuffed campaign furniture of the Victorian Era was unpractical for the new hit-and-run tactics which demanded something lighter and more austere. The Roorkhee Chair came out of this need for a chair that was both simple and still robust enough to stand rough treatment. 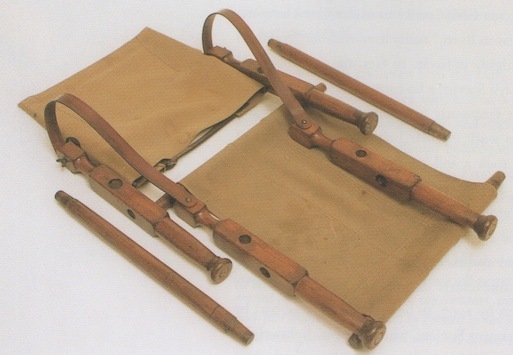 Weighing between 11 and 13 pounds, the chair was usually covered in canvas with leather straps for arms and easily broke down for travel. The design also had the advantage of allowing the chair to sit with all four feet level no matter how uneven the ground was. The name of the designer is lost to history, but the chair was named in honor of the Indian Army Corps of Engineers in Roorkhee, India. Roorkhee chair fitted with canvas seat and back. 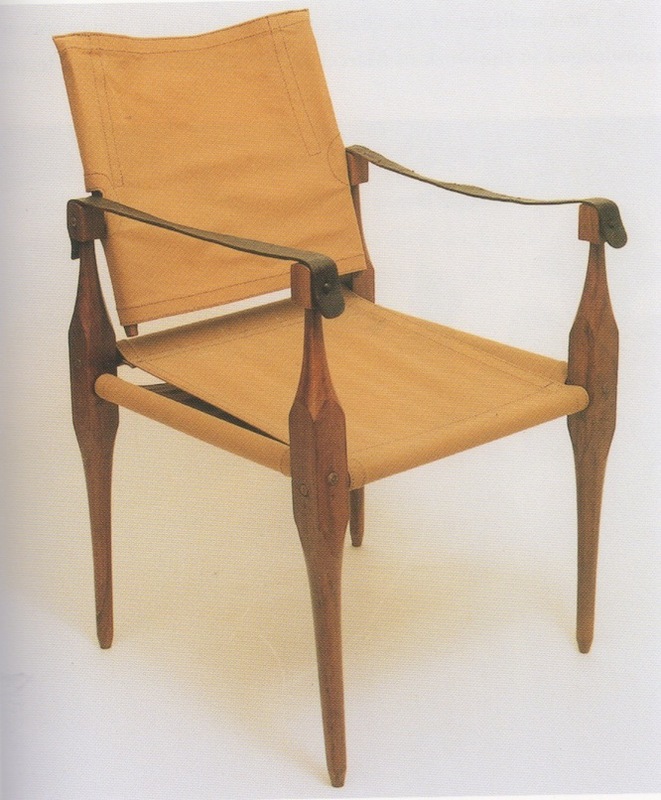 From British Campaign Furniture by Nicholas Brawer. Victorian Mahogany campaign chair from the 1870’s. 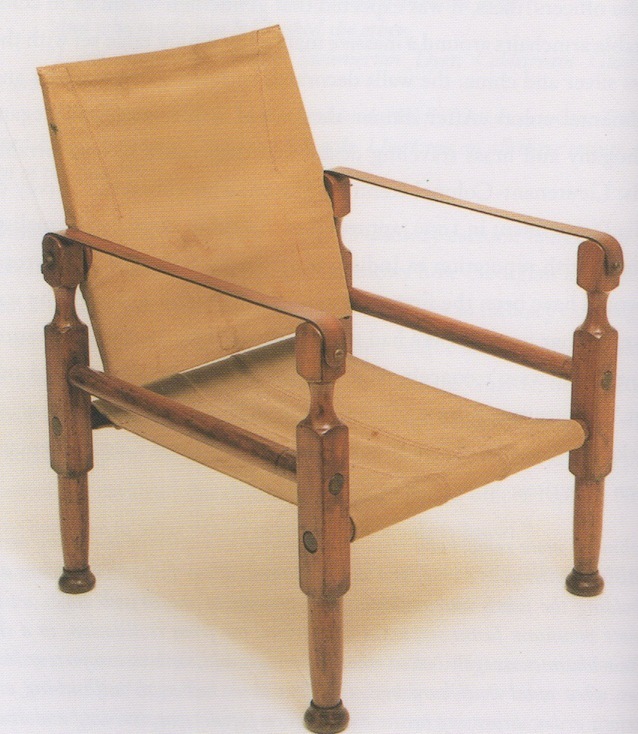 The ancestor of the Rorrkhee chair, it wasn’t as robust even though it could break-down as well. The pieces were carefully numbered to match their corresponding pieces to make assembly easy for anyone. Unfortunately Brawer’s book has been out of print for years, so if you find a copy you should grab it. There are reproductions being made including some very nice ones by Lewis Drake & Associates. If you’re handy with tools, you can try making your own. Christopher Schwarz, contributing editor at Popular Woodworking Magazine, and living patron saint to hand tool woodworkers everywhere, has done an article on making a Roorkhee you can find here. And you can download his Sketchup model of the chair here.